In order to understand the ENTJ, you need to know their four functions. The first primary function of an ENTJ is Extraverted Thinking or Te. And this is basically their primary way of seeing or interpreting the world. They want to control and direct their external environment. They like being organized and things to make logical sense. The second function of the ENTJ is Introverted Intuition or Ni. This function is more internal. It helps guide them to see the big picture and make long term decisions. An ENTJ is prone to getting “gut feelings” about a situation which tend to be eerily accurate. This function is also good at predicting the future by making sense of all the external stimuli they take it. This can all lead to others calling this function mysterious or metaphysical in some way. The ENTJs tertiary function is Extraverted Sensing or Si. This function essentially deals with being in tune with their environment and basically being able to sense what is going on in the physical world. They are able to interpret and sense what is going on. Some ENTJs also use this as a way to be intimidating to others in order to get their way. This isn’t exactly an natural ENTJ strength, but it is something they use and develop later in life. The fourth function of the ENTJ is Introverted Feeling. Now this function never really becomes a strength for an ENTJ because they like for the world to be logical and make sense. This function is constantly at conflict with their Extraverted Thinking, especially when the ENTJ is stressed. This function primarily deals with the feelings and convictions of the ENTJ. The ENTJ is a doer and wants to accomplish the goals that they set out for. Letting feelings and emotions get in the way of process can be a point of conflict for an ENTJ with under developed introverted feeling. It is something an ENTJ must work to overcome. One strength of the ENTJ is that they take their commitments very seriously. They’re very dedicated to what they want to achieve and what they decide to do. If they come to a decision on something, they see it as their duty or mission to make sure that it is accomplished. They are also very good with money. Finances are just something that comes naturally to most ENTJs. They understand how the importance of money and they tend not to spend it foolishly. They do sometimes have a desire to live extravagant lifestyle, but they’re always really good at making sure that all the finances are sorted out. They also have very high standards and expectations. They want to achieve more and they’re not really content with just staying stagnant. That is usually strength, although this could cause some problems with other people that may be more comfortable with the way things are currently. The ENTJ also is very good at grasping difficult concepts and theories. They are very intuitive and they understand how things work and can piece together everything. ENTJs enjoy reading, learning new things, and always improving themselves. They are also very good communicators. ENTJs are very good at expressing their point of view, as well as directing others. These abilities make them natural leaders or managers. While all types have their strengths, every type also has weaknesses as well. One weakness of the ENTJ is that they can be challenging and confrontational. They like to express their opinions of what they believe. In doing so, they may not take into consideration the feelings of others. Doing this could disrupt the harmony in their relationships and make it challenging for others that are not as good at handling criticism. They also can be critical and close minded to differences in the opinion. The ENTJs have a tendency to believe they are always right. And most of the times, they are. However, this can cause them to be too dismissive of others opinions. Just because someone has a different view does not mean they are wrong. Another weakness of an ENTJ is that they may have trouble expressing love and affection. ENTJs tend to compartmentalize their feelings and this can cause them to be emotionally unavailable to others that they are close to at times. They may need to work on being more open with themselves to people they are intimate with. ENTJs may also be prone to making hasty decisions. The ENTJs tend to usually think things through, but there are also times when they want to take action on the first solution that comes to mind. The ENTJ is very decisive and wants to come to a conclusion quickly so they can act on it. However, there are times when they haven’t done enough research or gathered enough information to make a truly informed decision. An ENTJ could want to suspend judgment in these situations. This causes the ENTJs four main functions to flip. When the ENTJ is stressed, they may want more time alone to sort their problems out. They may also become very emotional and sentimental during this period. They can get stressed out and become very overwhelmed. They could express this outwardly towards other people or just sulk a little bit and go into their withdrawal mode and just want to be alone. ENTJs are normally good at taking criticism constructively. But during this time they could be very sensitive to criticism and not want to listen. They may also become much more impulsive during this time. The ENTJ could develop bad habits like gambling, drinking, or taking drugs excessively. This is uncharacteristic of how the ENTJ typically behaves. In this state they can lose a bit of their self control. I have written a couple free reports on how the ENTJ can grow and improve as a person. 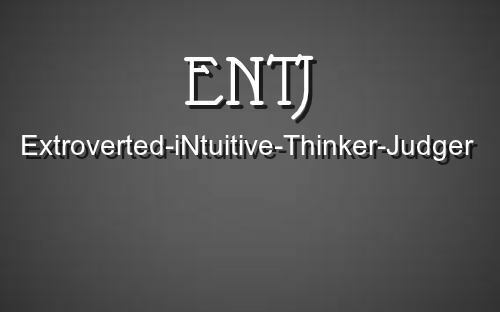 I also have one on jobs and careers that are suitable for the ENTJ.